Billboard image advertising the tavern. 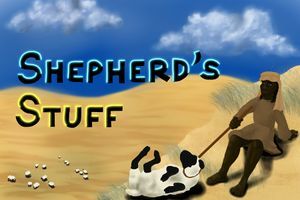 Shepherd's Stuff is a tavern chain in Godville that specializes in lamb, mutton, and fermented ewe's milk. New patrons could be forgiven for thinking that Shepherd's Stuff is a tavern designed to appeal to nomads, herders, and animal husbandry specialists. However, these laborers and professionals are unlikely to avail themselves of the premises, because the name actually refers to the general cuisine, which is all things sheep. The founding owner of Shepherd's Stuff, Milton Banes Sr. III, shared his reasons for founding the tavern, "There was no place I could find to get a good lamb kabob. Shocking, isn't it? This great big land of ours, commerce flowing in all directions, and the only examples of grilled-meat-on-a-stick were hoary, tough, flavorless things roasted by sticking them up in the air to catch lightning, or dousing them in kerosene and setting them alight. So, in the name of lamb kabobs done right, with sauces, yogurts, and grill marks done to perfection, I opened my own restaurant." He has gone on record with multiple recipes used for dry rub spicing and marinades used on his sweet, hot, tangy, sour, and mild kabob variants, which aficionados and home chefs report as accurately approximating the flavors served at the tavern. Gjeitost and Toast -- Dense, block-form goat's cheese, served with a sharp knife and a never-ending plate of various flavors of bread toasted crisp and warm. Lamb Kabobs with Yoghurt and Hummus -- Served family-style, and recommended for parties of two or more. Leg o'Mutton in Sleeves -- This haunch of adult sheep is slow-roasted over an open flame, and served wrapped in and on a bed of flour tortillas. At the diner's request, seasoned rice may be substituted for the tortillas. Haggis -- A mix of seasoned grains, vegetables, and organ meat minced together and boiled in a sheep's stomach. Enjoy this finest o' the pudding race with crackers, celery, or a spoon. "On the Lam" Chops -- So good, they ought to be illegal. These tender morsels of lamb only come from the springiest little bleaters. Served with a side salad of new greens. Slosh -- Being fermented ewe's milk, processed to the same recipe and standards that the Barbeerians of the steppes have used to attempt to turn mare's milk into beer for many an age. Protein Shake -- Not for the faint of heart, this mixture of unpasteurized sheep's milk and blood is created fresh and served in a gourd, a la nomadic cattle tribes on some of the islands of the Sacred Archipelago. Shepherd's Stuff also attracts a fair quotient of heroic traffic by offering a more standard assortment of beers. Visitors to Shepherd's Stuff will likely notice a lot of shearling and ewe-hide floor coverings, as well as woven wool tapestries covering the walls. So plush is the decoration, that new parents may consider taking advantage of the discount Banes offers on baby pictures "sheer on a sheepskin rug." Psychologists in Monstro City recommend against this, for the future mental health of the child, but also note that having more gold by which to put their own children through university never hurts. ↑ The most recent survey performed by the Lostway Department of Employment has determined "shepherd" to be the most hazardous career in Godville. This is presumed to be due to the prevalence of Battlesheep, Black Sheep, and Despicable Ewes that mingle with normal herds. ↑ Banes is a known antagonist of the chef at The Sword & Sandal, and they frequently insult each other through the media. ↑ "Alternative Careers in Godville," Young Heroics Magazine. Issue 13, Volume 6, Lostway Academy Press, 78 g.e. This page was last edited on 29 March 2019, at 02:10.